PS-84 photographed at Schelkovo Airport, Moscow. The year 1932 was a climax of serious reorganizations in Soviet Civil Aviation, and the outcome of those shake-ups became the Aeroflot. It will be fair to consider this new state-controlled giant a success: volume of the passenger air traffic almost quadrupled between 1933 and 1935. Such a rapid growth put a pressure on the aviation industry to increase the capacity of airfleet. At the same time, competition on the international routes required a service quality. But the major workhorse of domestic airlines was still the K-5, and the sole aircraft to claim a title of airliner was the ANT-9. In the age of rapid technology progress both aircraft became more and more outdated. New domestic machines of mid-30's like ZIG-1 and PS-35 did not impress the GVF leadership. On this background "Douglas Revolution" in the USA attracted attention of Soviet leadership. In August 1935 Soviet-American joint company "Amtorg Trading Corporation" purchased the DC-2-152 (factory N°1413, registration N°14949). This aircraft was evaluated at OELID TsAGI and studied by experts from ZOK. Interestingly, the civil expert did not let military to evaluate DC-2. Despite pressing requests, only a brief "walkaround" was granted! It was decided to produce Douglas at the USSR - but how? Opinions ranged from copying the DC-2 without license (GUAP) to licensing supported by payed technical assistance from Douglas Company (Ya.I.Alksnis, head of the UVVS). Opinion of the military this time was taken into account, since new aircraft was considered a military transport, not just a civil airliner. Plans existed in 1936 to build a military (bomber) variant as DB-1 (B-18 "Bolo"). This project was 'intercepted' by Ilyushin DB-3, re-appeared in 1939 and finally abandoned as obsolete. On April 11, 1936 the license agreement was signed, lighting green light for DC-3 production in the USSR. 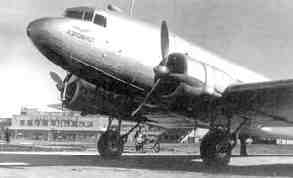 At the same time, 18 DC-3 were purchased with help of two ghost aircraft companies ("North Eastern" and "Excello"), set up by "Amtorg". Those aircraft were delivered in 1936 - 1938, and the last aircraft arrived disassembled (officially - for spares). When those 'spares' were delivered (in August 1938), both "North Eastern" and "Excello" vanished. 44k b/w DC-3-196 ready to takeoff from Moscow, Winter 1940. Propeller spinners were installed in the USSR. "Douglas by Lisunov"
In 1936 large group of designers and engineers (including V.M.Myasischev, B.P.Lisunov and M.I.Gurevich) visited the USA with major goal to study new progressive aviation technologies, allowing higher labour productivity and assembly quality. Right after his return from Santa-Monica ( Douglas plants), V.M.Myasischev was promoted to rank of Designer General, and his Brigade N°6 of KOSOS TsAGI became a Special Design Bureau of Factory N°84 at Khimki (Moscow suburb), where production of the DC-3-196 was planned. New team was quite strong: his deputies were I.P.Tolstyh and I.P.Mosolov, designers B.P.Kascheev, A.I.Gordinskij, M.A.Mostovoj, A>A>Senkov, Rachitskij, Berdyshev, factory Director A.M.Yardin, Senior Enginer B.P.Lisunov, Senior Technologist N.V.Lysenko. First task was a conversion from Imperial to Metric systems, with simultaneous correction for mechanical properties of domestic materials (weights, strength, elastisity, resonances - name it). Another serious problem was manufacturing/assembly technology itself. V.M.Myasischev took into account negative experience of the AGOS TsAGI with the ANT-43 fiasco. Factory N°84 team employed not a cavalry attack of the AGOS but a steady siege - and enjoyed a success. It is worthy to mention that such a prominent aircraft manufacturers as Dutch "Fokker" and Japanese "Mitsubishi" failed to reproduce the same licensed technology, and had to assembly 'their' DC-3 from US-made parts. 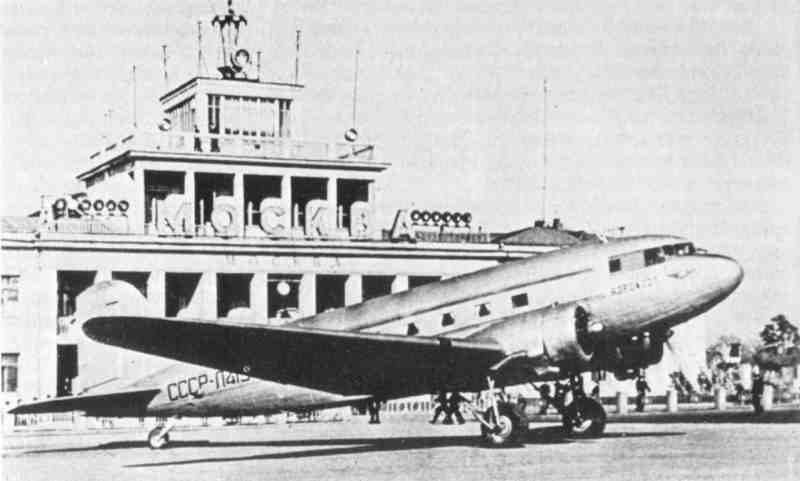 44k b/w PS-84 at The Moscow, Central Airport, May 1941. Landing gear of early (American) configuration. "Douglas by Lisunov"
On November 7 (October Revolution Day) 1938 team of Factory N°84 reported about assembly of the first aircraft. 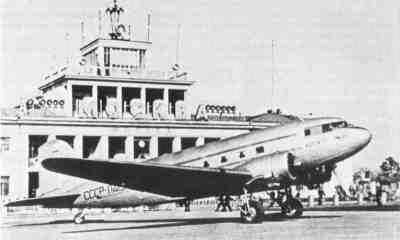 This one was an original 18th DC-3, delivered "for spares". More than half a year aircraft spend inside... it rolled out only in Summer 1938. This happened without person who played major role in the early history of PS-84. V.M.Myasischev fell under suspicion as an "enemy of the people" as early as in 1937 In the beginning of the 1938 V.M.Myasischev was imprisoned (actual accusation is still unknown). 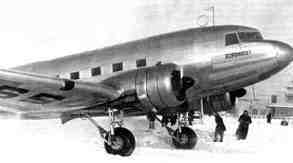 Leadership of the DC-3 2M-62IR project was transferred to A.A.Senkov, long time friend an colleague of V.M.Myasischev. After brief factory trials it was sent to the NII GVF, where State Acceptance Trials began on September 3 1939. 166 flights (73h45min) were performed. On December 17 DC-3 2M-62IR (or simply "Douglas") was approved for production under official designation PS-84 (Passazhirskij Samoliot of Factory N° 84). Right from the trials first PS-84 was sent to the front (Finnish War), where it was used for transportation of wounded to mainland. Military specialists also expressed interest in new aircraft. Even prior to assembly of the first PS-84, in the end of 1936 B.G.Shpitalny and N.N.Polikarpov proposed a gunship version (not built). One of the very first built PS-84 was actually a PS-84-K paratroop carrier/transport with cargo hatch and door for paratroopers. It could be converted by aircraft mechanic into ambulance PS-84-I. Mass production of PS-84 started even prior to the State Trials, and at the end of 1939 six aircraft rolled out. Soon Factory N°124 (Kazan) joined the production, but they built only 10 aircraft. Despite the production rate lagged behind the planned one, domestic "Douglases" impact on passenger flow was quite visible. At the moment of German invasion, the GVF had 72 PS-84 in inventory. At late Fall 1941 Factory N°84 was evacuated. Production was re-established at Tashkent Factory N°34, but this transition took several months. During all the time, Factory N°84 kept assembly running - equipment for early stages was evacuated first etc, as work on airframes was progressing. As a result, 158 more PS-84 were built until production in Moscow ceased at the very end of 1941. Production at Tashkent Factory N°34 had a slow start - many qualified workers of Factory N°84 joined the army (Opolchenie) to defend the capital and their place at production lines was taken over by wives and youngsters, who lacked the necessary skills. Since the middle 1942, production rate of the PS-84 started to grow. On September 17, 1942 aircraft received a new name which became famous - Li-2, after B.P.Lisunov who was the key figure in establishing of the PS-84 mass production. Until the end of the war, designation Li-2 was used for the military variants only.